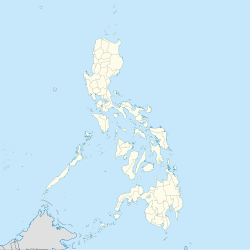 Tuburan, officially the Municipality of Tuburan, (Tausūg: Lupah Tuburan; Chavacano: Municipalidad de Tuburan; Tagalog: Bayan ng Tuburan), is a 2nd class municipality in the province of Basilan, Philippines. According to the 2015 census, it has a population of 20,207 people. In 2006, the municipalities of Akbar and Hadji Mohammad Ajul were created from Tuburan, reducing its number of barangays from 30 to 10. Tuburan is politically subdivided into 10 barangays. In the 2015 census, Tuburan had a population of 20,207. ^ "Muslim Mindanao Autonomy Act No. 193; An Act Creating the Municipality of Akbar in the Province of Basilan and for Other Purposes" (PDF). Regional Legislative Assembly, Autonomous Region in Muslim Mindanao. Archived from the original (PDF) on 4 February 2016. Retrieved 21 April 2019. ^ "Muslim Mindanao Autonomy Act No. 192; An Act Creating the Municipality of Hadji Mohammad Ajul in the Province of Basilan and for Other Purposes" (PDF). Regional Legislative Assembly, Autonomous Region in Muslim Mindanao. Archived from the original (PDF) on 4 February 2016. Retrieved 27 January 2016. ^ "Municipal: Tuburan, Basilan". PSGC Interactive. Quezon City, Philippines: Philippine Statistics Authority. Retrieved 8 January 2016. ^ "Tuburan, Basilan : Average Temperatures and Rainfall". Meteoblue. Retrieved 29 January 2019.